Cobalt Blue Inc, as a part of their Art of Seeing Series, presents "BEYOND MYTHOLOGIES - THE LEGEND OF BRAHMA." 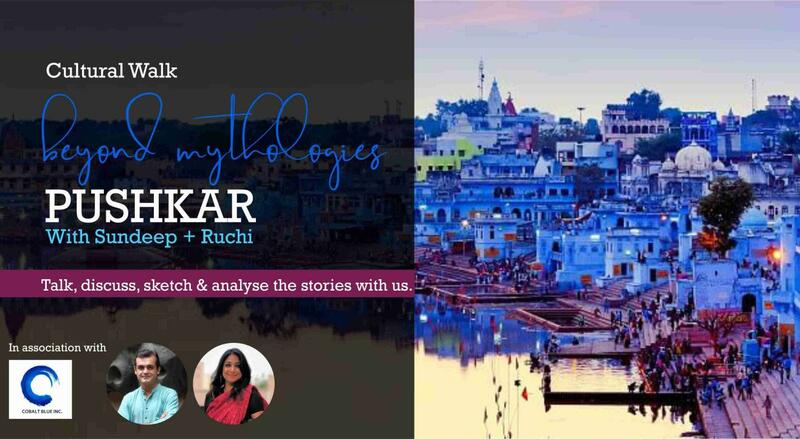 Join your hosts Sundeep & Ruchi for a storytelling walk though the mythological city of Pushkar. Discover the legend of Brahma & various mythologies associated with him. Know the legendary stories of Savitri, also known as Saraswati and Gayatri, the two wives of Brahma. The walk will be interactive discussions followed by Q&A. There will poetry, prose & sketching too. Join in for tea/snacks for discussion and Q&A. Sundeep & Ruchi invented Art of Seeing Walks around India covering various Art Galleries & Museums to generate more interest in art for people. Besides that Sundeep Verma conducts various workshops, talks and lectures on the Art of Storytelling. He has worked in advertising for 17 years. Ruchi is an artist and psychologist. She conducts workshops on art therapy. International Business Times has identified Pushkar as one of the ten most religious places in the world and one of the five sacred pilgrimage places for the Hindus in India. It is one of the Panch-Sarovar of Hindu theology and the most holiest pilgrimage site of Hinduism. The Hindu scriptures describe it as "Tirtha-Raj," the king of pilgrimage sites and relate it to the mythology of the creator-god Brahma, whose only prominent temple stands in Pushkar. Ramayana and Mahabharata refer to Pushkar Lake as Adi Tirtha, or the "original sacred water-body." It is dated back to 4th Century BC. The 10th Sikh guru, Guru Govind Singh is said to have recited the Sikh sacred text Guru Granth Sahib on the banks of the lake. During Mughal Rule, Emperor Akbar revived the lake for pilgrimage. Pushkar is considered one of the most sacred places in India.